My name is Jamie D’Souza and I’m from Montreal, QC. I am currently in my second year of master’s degree in Geography, Environment and Geomatics at the University of Ottawa in Ottawa, ON. I decided to fulfill a master’s degree because, truth be told, I really wanted to see a polar bear in the wild and I couldn’t quite afford to participate on the conventional polar bear viewing experiences. Scanning through the available supervisors and universities around the country, I stumbled on a paper written 10 years ago by my current supervisor Dr. Jackie Dawson, which analyzed the carbon costs of polar bear viewing in Churchill, Manitoba and how tourists understood the implications of travel on the environment. Immediately, I knew this is what I wanted to research and explore. It was the perfect way to combine my three passions – the environment, travel and polar bears into a research project and contribute to the existing literature and hopefully help to shed a light on the tourism industry to become more environmentally conscious. In between course work and proposal writing, I was in communication with the Churchill Northern Studies Centre (CNSC) (particularly with the Scientific Coordinator, LeeAnn Fishback) to figure out how I could successfully implement this research project. 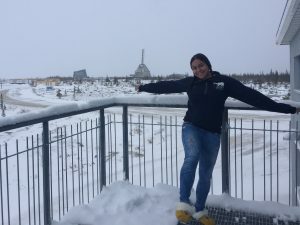 I decided that I would travel to Churchill and survey tourists who had participated on a polar bear viewing tour and ask them about their trip, their motivations for traveling to Churchill, their knowledge about climate change, and their opinions on potential solutions for reducing carbon emissions in the tourism industry. 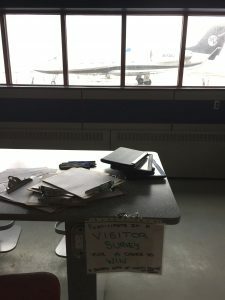 These surveys would be conducted at the CNSC and the Churchill Airport during the polar bear viewing season. Fast forward to October 2018, my winter clothes were packed, camera was charged, the surveys were finalized and printed, and I was ready to begin my journey to Churchill, Manitoba – the polar bear capital of the world. 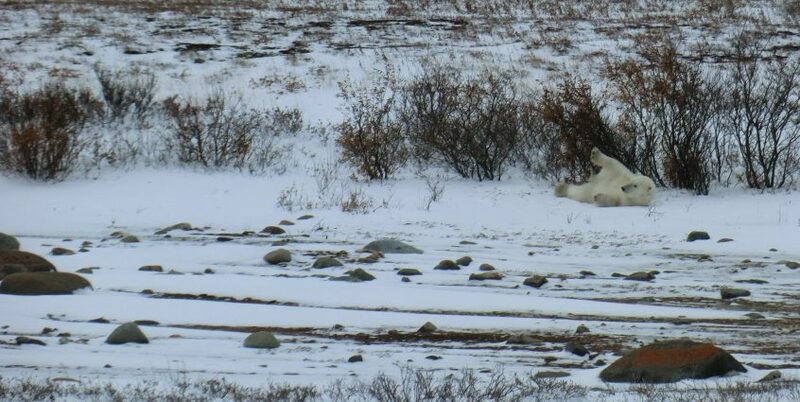 Upon arriving in Churchill, I was marveled by its beauty and couldn’t wait to see a polar bear in action, but I must admit, I felt scared and unprepared. This was the first time I was traveling alone, I had never conducted research before and later I would learn that I would be one of the only researchers at the Studies Centre during that time. I had no idea what I was in for. The staff at the CNSC took me in with open arms, provided me with the resources I needed to make my research successful, and were willing to help me in any way they could. Day 1 of arriving at the Centre, they had already helped me to begin conducting surveys. It felt great to be part of this community. I do also have to give a huge shout out to the staff at the Churchill Airport as well. They were so helpful, accommodating and incredibly patient during the times I was there talking on the intercom, trying to lure tourists to do my survey. I’m sure the airport is nice and quiet now! It turns out being the only research at the centre has its perks. Radio Canada Manitoba wrote an article about my research, I got to go on multiple polar bear viewing tours and saw many polar bears (the first one was up close at the Centre), I got to attend the street party in town when the train was re-opened and Justin Trudeau came for a visit (yes, I did get a selfie), I participated in trivia nights, and was able to talk about my research with people who were interested and had the knowledge and experiences to discuss this topic with me, which was refreshing. Not only was my research successful (I obtained 513 completed surveys), but Churchill opened my eyes to many things: how beautiful nature is, how amazing it is to live among the polar bears, how genuine people are and how much love I have for Churchill and am determined to make my way back and be part of the CNSC staff. Conducting research is extremely difficult and can be lonely at times but the CNSC (both staff and volunteers) made my experience so memorable and special and I cannot wait to return to this wonderful place again (once I’ve completed my degree this year) 😊!